A tribute to the great Bharatiya Samskruti. One day a Siddha by name Manovega came to Vikramaaditya Maharaja and said “Raaja! Near Udayaparvatam, there is a pushkarinii by name Aghanaasham. A Suvarna-Kalasham comes from it at Suuryodayam. As Suurya Bhagavaan raises, the Kalasham also goes up, at Madhyaahnam it reaches Suurya-mandalam. By Suuryaastamaanam, it again comes and goes into the Pushkarinii”. Listening to this Aashcharyam, Vikramaaditya Maharaja asked the Siddha how to reach Aghanaasham. Siddha replied that it can be reached through Yoga-maargam. He has a lehyam (paste) with him, which when applied to the leg, one can reach any place at Manovegam. Both of them applied the Lehyam and reached Aghanaasham. They waited for Suuryodayam. As the Siddha said, the Divya Kalasham came. Vikramaaditya Maharaja jumped and sat on it. By Madhyaahnam, along with the Kalasham, Vikramaaditya reached Suurya-mandalam. Seeing Vikramaaditya, Suurya Bhagavaan said “Kumaara! No normal person can bear my teevra Tejas. My abhinandanams (congratulations) to your Yoga-shakti. I am very happy with you. Keep these Divya-kundalas as a Bahumaanam (gift) from Me. These are not ordinary Kundalas, they give 8 Pushkariniis full of Suvarnam (1 Baaruvu) everyday”! Taking the Kundalas, along with the Kalasham, Vikramaaditya reached Aghanaasham, after doing Namaskaaram to Suurya Bhagavaan. He then left for Ujjaini. As soon as he reached Ujjaini, a Viprottama came near him and asked “Raaja! I live in Vidarbha-desham. With the Krupa of my elders, and the Dhanam earned by them, I do Annadaanam to 1000 people everyday. My Sodaras, with Iirsha, told asatyam about me and made the King give me punishment. I need to give away whole of my Sampada, property as a fine. In addition I need to pay somemore amount. To ask help from you I came here”. The Daana gunam of Vikramaaditya Maharaja is shown in the story. As soon as the Viprottama told his difficulty he gave away the Apoorva Divya Kundalas to the Viprottama. The Vinayam of the Viprottama is well shown in the story. Though he did many Anna-daanams he didnt have Garvam. He said only because of his elders he is able to do such good deeds. Once the great Chyavana maharshi went to Kushika maharaja. Kushika did ghana-puuja to Chyavana maharshi. “Muniindra! Please give us aagnya what to do” said Kushika with great Vinayam. Chyavana maharshi replied “Raja! You and your arthaangi do seva to me”. “Ok. Svaami!” replied Kushika. Kushika arranged for Chyavana maharshi Hamsa-tuulikaa-talpam (bed) and a Manipeetham. “Maharaja! Now I will take rest. Dont disturb me until, I by myself, wake up. Till then do my paada-seva” said Chyavana maharshi. For 42 days, Kushika and his arthaangi did paada-seva of Chyavana maharshi, forgetting Nidra-aahaaram. The next day Chyavana maharshi woke up and said “get me a Ratham. You both must pull it. I will go on it, giving Suvarana (gold), Ratna, Go (cow), Ashva daanams to the poor”. Immediately Kushika arranged for it. The King and Queen started pulling the ratham. Chyavana maharshi started to hit them with the horse-wip until they were bleeding and kept travelling. Finally they reached the end of the Raajyam. He saw that the King and Queen have a smiling face, even though their bodies were bleeding! Chyavana maharshi said “Raaja! Now you both got extremely exhausted. Please go back. I will stay here a do Tapas. Come again tomorrow”. Saying thus, Chyavana maharshi, the Aayurveda-nipuna, just touched them on their wounds and the wounds just disappeared. “Muniindra! Just by your Kara-sparsha we got new shakti in us and all our wounds have disappeared. How do we praise your greatness”, saying this, Kushika returned to his Raajyam. When they came back the next day, Chyavana maharshi was not there, but a Vishaala-sundara-divya Bhavanam was there. “Devi! did you see. Because of Maharshi, we are able to see such unbelievably beautiful Bhavanam, that resembles Svargam”. They went in and saw that Chyavana maharshi was lying down on a Mani-maya-paryankam (bed). But as soon as they came near him, everything disappeared. They saw that Chyavana maharshi was doing Tapas. “Kushika! I heard about you from Brahmadeva. I tested you very much and would have given you shaapam if you didnt keep up your word. But you are an Uttama. I was impressed by you and hence showed you both Svargam. But even then you didnt get attracted and said ‘Tapas is great’. Your Pautra (grandson) will be a great Brahmarshi. He will be the Mantra-drashta of the great Gaayatri mantram. There has been no King who attained the Brahmarshi-padavi. Your pautra will achieve with his will power, Satya-nishtha and parishrama. Kushika’s putra was Gaadhii-raaja and his putra was the great Vishvaamitra maharshi. The sadgunams Vinayam and Atithi-Seva-bhaavam of Kushika are well shown in the story. Kushika and his Raani, did paada-seva of Chyavana maharshi for 42 days continuously without even taking food and sleep. Kushika and his arthaangi had full control of their Indriyas (Indriya Nigraham). Even when their bodies were bleeding, they didnt get Krodham on Chyavana maharshi. Svargam will be at the will of such people. Story shows how doing seva to great sat-purushas like Chyavana Maharshi will give Shubhams. Doing seva to Chyavana maharshi, they got the great Vishvaamitra maharshi as their Pautra. Deepaka was a naishthika Brahmachari. He was once doing shastra-adhyayanam and saw this sentence — “For a pativrata, her bharta is the only Daivam. For a putra, his parents are only Devatas. For a shishya Guru is himself Parabrahma. There are no teerthas, vratas, upavaasas greater than Guruseva”. He immediately decided to approach a Guru, do seva to him and learn all shastras. On the great Godavari-nadi-teeram, there used to be the ashramam of Vedadharya. He used to teach many shastras, Vedopanishats to his shishyas. Deepaka approached Vedadharya, did saashtaanga-pranaamam to him and asked him to accept him as a shishya. Seeing the Vinayam of Deepaka, Vedadharya accepted him as his shishya. Because of his Guruseva and interest in learning Vidya, Deepaka in no time learnt all shastras. Deepaka, who only had Guruseva in his mind, was very happy to do his Guruseva and said “Guruuttama! Since I am young, I will do the aavaahanam of the paapas and experience the leprosy, blindness etc.” Vedadharya replied “O my son Deepaka! One is responsible for his own paapas. They must be experienced by the karta only. It is not very difficult to experience it, the more difficult thing is to do seva to a paapa-piidita. You need a have a lot of sahanam”. Deepaka and Vedadharya reached the great Kaashi Kshetram. They arranged a place for their living near Kamaleshvara Mahadeva Mandiram, which is to the North of Manikarnikaa-Ghat. After doing Kaashi Vishvanaatha, Jaganmaata Annapurna puja, Vedadharya did aavaahanam of the 2 previous janma paapas. He started suffering from the diseases as he explained before. He had no sahanam and used to show it on Deepaka. Deepaka used to cry seeing the Dusthiti of his Guru. He used to take great care of his Guru: neatly wash his wounds, clean blood and puss, apply medicine, tie bandages. He even used to clean the mala-mutras and put new clothes for his Guru. He used to do Bhikshaatana and get food for his Guru. Vedadharya used to eat the whole of it and used to blame Deepaka for not bringing sufficiently more. Deepaka never used to get angry and without any viraamam and with great care he used to do his Guru’s seva. One day, impressed by the Guruseva of Deepaka, Lord Vishveshvara appeared before him and said “Vatsa! Your Guruseva is amogham. Please ask me what you want”. With great aanandam Deepaka replied “Sarveshvara! In this world I dont know anything except my Guru. I will ask him after he wakes up from his sleep and tell you”. After Vedadharya woke, Deepaka told him what happened and asked him “I will go to Shiva and ask Him to heal you”. Vedadharya didnt accept and said “One must experience the result of his paapam. Then only they will be destroyed. Only in that I will have trupti”. The next day, Deepaka went to Vishveshvara sannidhi and didnt ask for any varam. Seeing the Aadhyaatmika-saadhana of Deepaka, Parameshvara took him to Nirvaana-mandapam along with Parvati Devi. There Shrimannarayana and other Devatas were there. There Shiva told everyone about the Guruseva and Sevaasakti of Deepaka and praised him. Shrimannarayana said “Please tell Us your abhishtam. We are ready to grant it”. Deepaka did saashtaanga-vandanam and replied with gadgada svaram “Devaadideva! I never did your Naama-smaranam. Neither did I do your puja or archana. Why are you ready to give me varam?”. “O Vatsa! Guruseva is equivalent to doing seva to all Devatas. Hence please ask Us what you want” said Shrimannarayana. “Then please grant me achanchala Guru-Bhakti” said Deepaka. All the Devatas were happy with Deepaka and granted him the same. Guruseva is equivalent to seva to all Devatas. Deepaka, with his unparalled Guruseva, had the Durlabha-darshanam of all the Devatas. Vinayam, Guru-Bhakti and interest in learning are very important for a Vidyarthi. One who has these qualities can learn all shastras in no time, like Deepaka. One must experience the result of his paapam some or the other time. This was told by Vedadharya many times in the story. Hence one must be very careful not to do paapa-karyas. “There are 10000 Yaduvīras, who are all equal to Me in Vīratvam. They never go against My word and help you in the Yuddham without śakti-vañcana. They all will be on one side and I alone will be on the other. I will never use any Āyudham. I will help as a Rathasārathi”. Śrī Kṛṣhṇa then asks Arjuna to choose which half he wants; then he asks Duryodhana. Ofcourse both of them get exactly what they want. Arjuna chooses Śrī Kṛṣhṇa and Duryodhana was more than happy to take the remaning 10000 Yaduvīras. Śrī Kṛṣhṇa knows that first He has seen Arjuna and it was Duryodhana who came first. So both must be given equal chance and hence divides his sainyam into two. Now Śrī Kṛṣhṇa addresses Arjuna as Bālaka while asking him to choose first. There is a Śṛti vākyam that says “Pravāraṇam tu bālyānām pūrvam” “Kāryamiti ŚrutiH Tasmātpravāraṇam pūrvam Arjuna Pārtho DhananjayaH”. According to this Śṛti vākyam, a bālaka must be given preference. Since Arjuna was younger than Duryodhana, Arjuna must be given preference according to Dharma. Kṛṣhṇa paramātma, who is Dharma in human form, obviously followed this Dharmasūkṣham and helped both his relatives impartially (samavarti). Even though Arjuna is His priya Bhakta and Duryodhana did not follow Dharma, Śrī Kṛṣhṇa greeted both of them equally as they were equally close relatives. He divided his sainyan into two to help Arjuna, whom he saw first, and help Duryodhana who came first. This shows us the great satguṇam of Samavartitvam (impartiality). The importance that one must give to learn, know and always follow the Dharmam is well shown by Śrī Kṛṣhṇa. He gave Arjuna a chance to choose first according to the above said Śruti vākyam. Vinayam brings a Vīra, his śobha. Arjuna by sitting at Śrī Kṛṣhṇa’s feet showed his satguṇam of Vinayam. Duryodhana, even though he went to Śrī Kṛṣhṇa to ask for help, did not show any Vinayam. The dṛḍha viśvāsam of Arjuna in Śrī Kṛṣhṇa is shown well: even though he had the chance to choose 10000 Yaduvīras (who were each equal to Śrī Kṛṣhṇa in Vīratvam), he chose Śrī Kṛṣhṇa (who will not use any āyudham). It is always recommended to read our Purāṇas and Itihāsas, in Samskṛtam or Bhāratīya bhāṣhas, with the help of elders, Paṇḍitas and prasiddha (well accepted) Vyākhyānas to know and learn all the Dharmasūkṣhmas well. This series of stories on Śrī Kṛṣhṇa līlas try to bring out some durguṇas, commonly found in people, and thus warn us to be away from the same. Listening to the sāhasakṛtyas of Śrī Kṛṣhṇa, Yaśodā Devī had kalavaram. She thought even though they left Nandavrajam and came to Bṛndāvanam, the utpātas did not stop. Seeing the duhkham of Yaśodā, Nandarāja consoled saying “Śrī Kṛṣhṇa is not a sāmānya bālaka. Garga maharṣhi told us about this. For the good of Him do many dānas, Annadānas”. Yaśodā Devī made Balarāma-Kṛṣhṇas do many dānas and Annadānas. Balarāma-Kṛṣhṇas used to beautifully do alaṅkāram of Gomātas and take them. Śrī Kṛṣhṇa used to follow the cowherd closely so that Go-dhūli falls on Him. However without having Paramātma Darśanam Gomātas were not able to move their feet forward. Hence Śrī Kṛṣhṇa Himself used to be at the front, middle and end of the cowherd simultaneously. The Jīvātma-Paramātma sambandham is truely very deep. In Madhurānagaram there was a Tālavanam. There used to be a dānava by name “Dhenuka” in gārdabhākāram in the Tālavanam. Once all the Gopālas along with Balarāmadeva and Śrī Kṛṣhṇa went near the Tālavanam. The Gopabālas, afraid of Dhenukāsura, requested Balarāma-Kṛṣhṇas to get them the madhura Tāla-phalas (tāṭi paṇḍlu). Balarāma-Kṛṣhṇas entered the vanam and shook the trees, making the fruits fall. A donkey has more power in its back legs. Dhenuka kicked Balarāma to 4 krośa distance away! Unaffected, Balarāma, hit the Dhenuka against a Tālavṛkṣham. Though a donkey normally does’nt have horns, this Dhenuka had 4 and started to attack the Gopālas. Śrīrāma, Subala and others replied with sticks, pāśas and astras. Nandakiśora threw him to Govardhanagiri, making him unconscious. After gaining his consciousness, he took the Paramātma in to sky and started yuddham. Śrī Kṛṣhṇa threw him down and threw Govardhanagiri on dhenukāsura, like a ball. Dhenuka threw it back and Śrī Kṛṣhṇa kept it back at the same place and signalled Balarāmadeva. With one muṣhṭighātam of Balarāmadeva, the Dhenuka was killed and his tejas entered the Paramātma. Sāhasika was the son of Balicakravarti (see this too). He once did vihāram on pavitra Gandhamādana Parvatam (where many ṛṣhis, munis do tapas and Paṇḍavas also lived for sometime), with 10000 vanitas. They exceeded their limits and the tapas of Dūrvāsamaharṣhi was disturbed. “Without any kind of vinaya-vidheyata you behaved like a gārdabham. So become one” said the Maharṣhi. After begging the Maharṣhi for kṣhama, the maharṣhi gave abhayam “in Dvāparayugam through the hands of Balarāmadeva you will get mukti”. Since Paramātma told Prahlāda that He will never kill anyone in his dynasty (one uttama/bhraṣhṭa is enough to save/destroy an entire dynasty), he signalled Balarāmadeva to kill Sāhasika (Dhenuka). Durguṇam to be unlearnt: Not having Vinayam-vidheyata and doing whatever pleases oneself. Devatas and daityas always have fights among themselves. The daitya's Guru is Śukrācārya. He knew the vidya of mṛtasanjīvanī, which he obtained through a long tapas for Parameśvara. Using this vidya, Śukrācārya used to bring back the dead daityas to life and save them. However the Devatas neither knew the vidya nor had amṛtam, because this story happened before the Kṣhīra sāgara mathanam. The Devatas asked their Guru, Bṛhaspati, for help. Bṛhaspati asked his son, Kaca, to become a śiṣhya of Śukrācārya, do Guru seva with utmost care, learn all the śāstras etc. and the mṛtasanjīvanī vidya from Sukrācārya. Kaca immediately followed the instructions of his father and reached the āśram of Śukrācārya. He did sāṣhṭāṅga namaskāram to Śukrācārya and said "O Gurudeva! I am from the Āṅgīrasa gotram and the son of Bṛhaspati, the Guru of the Devatas. People call me by the name Kaca. I came to you as a vidyārthi". Śukrācārya happily agreed to have the son of the great Bṛhaspati as his śiṣhya. Everday Kaca used to wake up before the Sun, and do Sandhyāvandanādi āhnikas, after his kāla-kṛtyas. He used to be very obdient to his Guru and learn his vidyas with utmost concentration and respect. He never let any attractions, diviations to enter his mind and always concentrated on Guru seva and his vidyābhyāsam. Śukrācārya had a very beautiful daughter by name Devayānī. She was very young and had a lot of prema for Kaca. She tried to express herself many times to Kaca, but Kaca never had anything in his mind except his vidyābhyāsam. Also since Devayānī was the daughter of his Guru, who is equal to his father, he had sodarī-bhāvam on Devayānī. Slowly Kaca, due to his unparalleled efforts and vinayam became the favourite śiṣhya of Śukrācārya. This could not be tolerated by the daityas who were burning with īrṣha. Also they were afraid that Kaca would soon learn Mṛtasanjīvanī vidya from Śukrācārya and later it would be difficult for them to face the Devatas. 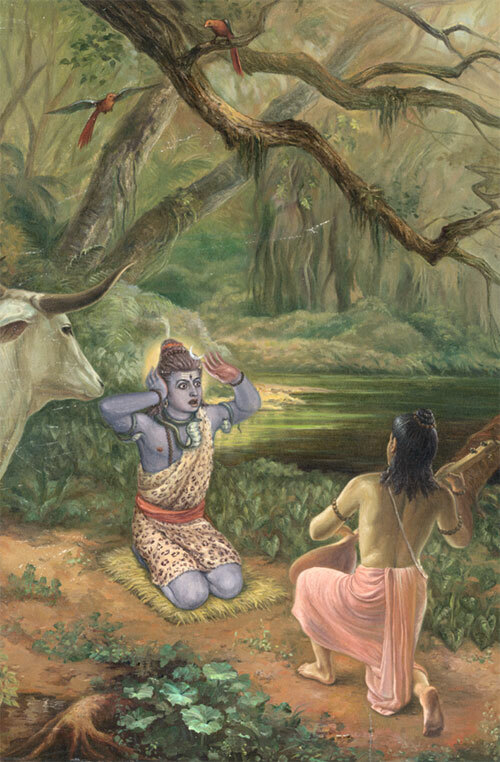 Once Kaca went to the forest as his Guru's gopālaka. As the Sun was setting the power of daityas increased. They attacked Kaca and killed him. Devayāni was waiting for Kaca in the āśram. She told her father, "everyday by the time for sāyam-sandhyāvandanam, Kaca returns home. Somehow he did not return today. O father! please see if he is ok." Śukrācārya with his divya-dṛṣhṭi saw what happened to Kaca and immediately brought him back to life. The daityas īrṣha increased with this and this time they planned to kill Kaca in such a way that it will be difficult for Śukrācārya to save him. They killed Kaca, burnt him and mixed his ashes in surāpānam and served it to their Guru. Śukrācārya drank the surāpānam. Seeing Kaca not returning home, again Devayāni asked her father. Śukrācārya was shocked to know what mistake he committed unknowingly. He thought "a man who is under the influence of surā-pānam will loose all his distinction of good and bad, does not think and can do any great pāpa-kāryam". Once the pāpa-karyam is done, for normal humans, it is impossible to undo it. Śukrācārya thought that if he was not under the influence of surāpānam, he could have easily identified, with his tapobalam, that Kaca's ashes were mixed in his surāpānam. So he made a firm rule that surāpānam, in what ever small quantītes, is mahāpāpam and it must never be drunk. The importance and greatness of Vidya is well shown in the story. Though Devatas and daityas were enemies, Kaca never tried to conceal his identity, since he knew by cheating a Guru vidya cannot be acquired. Also Śukrācārya, knowing who Kaca was, accepted him as śiṣhya, because a deserved one must always be taught. Vinayam and kṛṣhi are were important for vidyābhyāsam. Kaca was never involved in any other activity than his Guru seva and studies. One must never have jealousy. Because of jealousy that Kaca is performing better than them, the daityas did not think what is right and what is wrong. Surāpānam, in what ever small quantites, must not be done. This is well shown through Śukrācārya's words. The knowledge of Kaca helped him decide whether to accept Devayāni's love or not. “There are two mahaa-phala daayaka Vrukshas. One by the name Vaasudeva and the other by the name Vaamadeva. They differ only in their sumas (flowers) (‘su’ is replaced by ‘ma’ in their names), but both give the same phalas (fruits, which is moksham)”. It is also often said, “How much one does not see the difference between Shiva and Vishnu, that much his aayu will increase”. One day, when Lakshmi and Vishnu were together in vihaaram, Lakshmi sees Ucchaishravam, her brother, the horse of Revanta who is the son of Surya. Engrossed in seeing her brother, she does not reply to the repeated calls of Vishnu. Seeing her attraction, Vishnu gives her shaapam to go to Bhulokam in the form of a horse and come back to Vaikuntam only after getting a son equal to Himself! She comes to Bhuloka to experience the shaapam and realizing that none other than her brother, Shiva can help her calm Vishnu, she immediately does a tapas for Him and Shiva appears to save her soodari. Lakshmi says “You and Vishnu are both same, the Paramaatma. Please help me!”. Shiva says “Soodari! How do you know that we both are same? All learned people know that. Who told you?”. Lakshmi says, “Once Mahavishnu Himself told me this. Seeing Him in deep Daiva-dhyaanam, I asked Him “During Samudramanthanam, I thought you were the greatest of all and hence chose you. Devaadideva! Who is better than you that you are in dhyaanam of Him?”. Mahavishnu replied “I am doing Shankara-dhyaanam. He is Eshwara. He is the same as Me. All learned people know that. If someone is my devotee but still hates Shiva, he will fall into naraka”. Saying this, She asks Shiva to pursuade Vishnu to bless Her with a child. Shiva sends Chitrarupa as a duta to convince Vishnu. Vishnu immediately accepts and comes to Bhuloka and blesses Lakshmi with Ekaveera, who is equal to Vishnu Himself. From Ekaveera came forth the Haihaya dynasty, of which the most noted king is Kartavirya Arjuna (Ekaveera’s grandson). Restricting the great samudram, Raama along with His entire army crossed the satpa-samudras! Hanuman, in one small jump, crossed it! In the greatest, unparalleled ghora-yuddham, which was never seen before or will ever be seen, Raama killed Raavana! Hanuman killed Mairaavana, who was many times stronger than Raavana, with great ease! Krishna lifted Govardhana giri, balanced on his little finger and saved the lives of Gopaalas! Hanuman brought the Sanjeevani Parvatam from Himaalayas to Lanka and saved Lakshmana! Raama melted a stone, with the touch of His lotus feet, for Ahalya! Hanuman melted a stone with His sweet Gandharva gaanam! Impressed by the great tapas of Viṣhṇu for Paramaśiva, Śiva gave Viṣhṇu the Sudarshana Cakram. Once Shri Krishna, the avataar of Mahaavishnu, came to Upamanyu maharshi, when he was at Himaalayas. Shri Krishna said “Upamanyu muniindra! You are the greatest in the Shiva Bhaktas. I came here to do Tapas of Paramashiva to get santaanam. Please teach Me Shaiva-vidhi and vidhaanam”. Upamanyu replied “O Shri Krishna! I know who You are. Shiva puuja is not new to You. Though You know it, to make everybody know, I will tell You …” Saying thus, Upamanyu told Shri Krishna how to do Shiva-aaraadhana. Once Vyaasa Bhagavaan came under the influence of Shiva-maaya and started telling in his Pravachanams that Vishnu is greater than Shiva. Once Nandeeshvara also heard Vyaasa Bhagavaan saying this. Vishnu Murty then appeared before Veda Vyaasa and told Him “O Maharshi! Dont you know that I and Shiva are the same? Knowing this why are you telling like this in your pravachanams?” Veda Vyaasa then had great pashchaattaapam and asked Kshama from Nandeeshvara. The phalam of Vishnu Pooja is Shiva Bhakti — the example is that of Arjuna. Arjuna ofcourse was the greatest Shri Krishna Bhakta. But it was Shiva who gave Arjuna moksham, when Arjuna was born as Bhakta Kannappa, in the great Kaalahastsi Kshetram. Similarly the phalam of Shiva Pooja is Shri Raama Bhakti — the examples are stories of Kaaka Bhushundi and Valmiki Maharshi. Kaaka Bhushundi was a great Shiva Bhakta and hence Shiva grants him Raama Bhakti Saamraajyam. Valmiki did tapas for Shiva using the Panchaakshari mantram given to him by the great Saptarshis and as a result became the Aadi Kavi and wrote the great Raamaayanam. Raasaleela. It was the day when the “punya-vruksham” of Gopikas delivered its ripe fruits, called Moksham. It was the day when the Aaraadhana of Gopikas was blessed by Lord Krishna. Gopikas realized Shri Krishna, the Sarvaantaryaami, everywhere. As a result of their Aaraadhana-bhakti they realized the paramaatma’s poorna-svaroopam with each one of them. 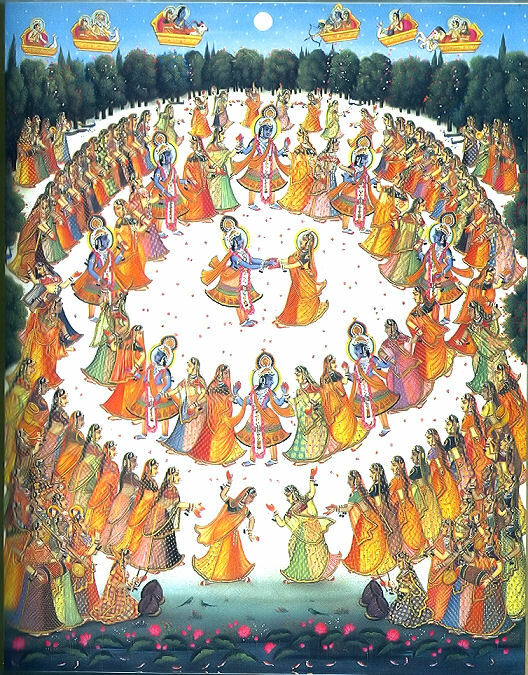 Who could miss watching the Raasaleela, where the Lord showered His Karuna-jyotsna ? All the Brahma-aadi devatas were present. Parama Shiva, the greatest bhakta of Shri Krishna, was also present in the form of a Gopika. Shri Krishna, who is always in nirantara-shiva-dhyaanam, searched for Parameshvara. Finally He realized that Shiva is none other than one of the Gopikas having sampoorna aanandam of dancing with Him. Shri Krishna paramaatma then does stuti of Eshvara and asks to bless them by staying there at Vrundaavanam by the name of Gopeeshvara. Even today we can visit Lord Shiva, in the form of Gopeeshvara, at Vrundaavanam. “Thiruthangal Uuranai”- Thirumangai aazhwar mangalasanam. Banasuran was a great devotee of Lord Shiva. He once prayed to Shiva to bestow him with thousand arms so that he can play the mrudangam during his rudrathandavam. Shiva too did so. But instead of playing the instrument with his thousand arms he started fighting battles against one and all. Instigated by this malicious act Shiva said “ A person equal to me shall severe your thousand hands.” Usha was the daughter of Banasura. She once saw in a dream that a young prince played with her. She immediately wanted to know who he was. Chitralekha started drawing hundreds of pictures which did not yield the expected result. She then drew the pictures of Yadava rulers like Balarama, Krishna, Pradyumna and Anrudha. As soon as she sketched the picture of Anirudha Usha was only too excited. “It is he, It is he”- she exclaimed. Chitralekha being a yogini atonce brought Anirudha to her chamber even as he was sleeping atop his house. They then played there for a long time. Some spy who oversaw all this complained to Banasura who arrested Anirudha for no fault of his. Lord Krishna fought a tough battle. Banasura sought the refuge of Shiva who faught on his side. Lord Krishna severed all of Banasura’s hands except four. Krishna then told Shiva “ Iam you and you are me. Those who show hatred against me or you though a devotee of either shall attain hell. I as Brahma create, as Rudra destroy and as Vishnu protect. Your devotee is mine and my devotee is yours.I shall not kill Banasura, he being a descendent of Prahlada.” Thus Banasura was consoled and Anirudha was married to Usha. Rudra showed false anger at Banasura and asked him never to join his bhutaganas. A repenting Banasura asked for parihara when he said that a dip in the holy waters of Papavinashini teertha at Thiruthangal will cleanse him of his sin. Banasura did so and rejoined Rudragana. Thus those who visit this kshetra will beget their lost status and also beget a good groom. Victory be to him who visits this kshetra. Shiva and Vishnu are the same. Both Raama and Hanuman did such super-human tasks, but they were never having even a bit of Ahankaar. They always were humble (see Setu-bandhanam story). Vinayam gives Vruddhi. Ahankaar Destroys. The story of Nahusha, the son of Aayu and father of the Yayaati, clearly shows us what un-attainable high positions one can achieve as long as he has vinayam and what drastic downfall can happen if one has ahankaar. Nahusha was raised in his childhood by the great Brahmarshi Vasishta. Since he was unaffected by happiness or sorrow and did not feel the slighest ahankaar when once Devatas praised him in his childhood, he was named Nahusha. He learnt all shaastras and after his education became the King. Due to his great qualities his fame spread quickly to all directions. Everyone was in praise of him, to such an extent that even vedas praised him. He performed 100 Ashwamedha Yaagas and hence was deserving the position of Indra. Once, Indra killed an asura by name Vrutraasura. Though Vrutra was an asura, he was a braahmana and hence Indra had to suffer brahmahatyaa-paatakam and Nahusha was offered the position of Indra. Nahusha continued to be good, until one day he realized that he was the ruler, king of all the 14-lookas! He suddenly became very proud and once a person has Ahankaar, he does not think, he assumes he is the greatest and that he can never be wrong. Such was the power of being the king for the Devatas and all the worlds! He sends a message to Sachi-devi, the great Pativrata and wife of Indra (the previous Indra, the eldest brother of Devatas) that she must serve him as he is the Indra now. The very moment he wanted a Pativrata, all his good qualities, tapas-shakti everything were lost and his end was destined. Sachi-devi tells Nahusha "O great Indra! You are the God of the Gods. You are very great, please come to my house. But you being so great deserve to be carried by none other than Saptarishis. So please come in a pallaqi beared by them". Nahusha really feels that what Sachi-devi said is true (did not realize that she was a pativrata and hence the real meaning behind her words) and immediately ordered the Saptarishis to do so. Obviously the Saptarishis have conquered anger and ahankaar so they carry him. Nahusha sits in the pallaqi beared by them and in the height of his pride says "Sarpa Sarpa" (go fast) to Agasthya muni, since he was very short and was taking small small steps. Agasthya muni said "sarpobhava", in order to teach Nahusha a lesson. And immediately from the high position of Indra, he falls as a Ajagaram (huge Python) in some deep forest. He spends thousand and thousands of years repenting for his mistake. Once when Paandavas were in the aashramam of Vrushaparva, Bhima goes to the forest and sees Nahusha who was in the form of an incredably huge Ajagaram. Bhima gets surprised by the amazing strength of it and asks it who it was. Nahusha tells his unfortunate story and says only the great Yudhishtira, who never deviates from the path of truth, can save him from this form. Meanwhile, Yudhishtira searching for Bhima reaches that place. Yudhishtira on knowing that the ajagaram is his ancestor Nahusha, he prostrates to him and takes his blessings. Later he answers all the questions of Nahusha and Nahusha gets freed from the terrible form, takes the form of a divya-purusha and goes to urdhva lokas in a divya vimaana. As long as Nahusha had Vinayam he was respected by everybody. Once taken over by Ahankaar, he committed great mistakes and later had to experience the result. Even for a great person like Nahusha, the power of simhaasanam made him bad. One must be more and more careful to be good and humble as his power in the society grows. Yudhishtira showed the way elders must be respected. One must never evaluate an elder for respecting them. According to our culture they always must be respected. Gnyaanam, knowledge of shaastra helped Yudhishtira answer the questions of Nahusha. One must always give utmost importance to gnyaanam and vigyaanam — using them one can acheive great wonders and help others. Pativratas power is graeater than anyone. One must never want a para-kaanta. Paushya’s mahaarani gives her kundalas to Udanka, but warns him that “Takshaka always has an eye on this — so be careful”. Udanka thanks the queen and returns to Paushya to ask him for leave. Paushya, who knows the shaastras, pleaded Udanka to accept his aatithyam and eat at his place. Udanka accepted the King’s request and Udanka sat to eat in a separate Bhojana shaala for vidvaans. The very first piece he was about to eat had a hair strand in it! For Indians, parishubhrata is of utmost importance and especially for eating. There are many rules in shaastras about how a person who eats must be, how the person who cooks must be and who clean the food itself must be etc. Even after following all the rules, some doshas might creep in. Hence Indians always put godhrutam (cow ghee) in the food before eating, considering the food as havis, the person who eats as havirbhokta and the the act of eating as a yagnyam! Ukdanda gets angry on Paushya for offering uncleaned food. Since he knows all shaastras, he knows that neither the cook nor the person who served nor the head of the bhojanashaala must be blamed, it is the ajamaani who gave aatithyam, the King, who needs to be blamed for this (see this story). He, in the anger, says to Paushya “Since you gave me such food, may you become blind”. Knowing that Udanka gave him such a big punishment for a small mistake, Paushya says to Udanka “May you have no children”. Since both Udanka and Paushya never deviated from the path of Truth, whatever they said now, in anger, became really true! The nature of a sajjana is that, he will never become angry and if he becomes angry, his anger will be like the spill of boiling milk, just for a fraction of a second. Immediately Paushya and Udanka realize their mistake and Paushya asks Udanka to save him from blindness. Udanka, with his tapas-shakti, told Paushya that he will be blind for a very short time. However Paushya could not give a shaapaavasaanam to Udanka. Paushya says “O great scholar! Since you are a sage and have immense tapas-shakti you were able to help me, but I cannot do it and my words cannot be changed, because of my satya-vaak-paripaalana”. Udanka then takes leave of Paushya and immediately resumes the work given by his Guru-patni. Will Udanka be able to take the kundalas safely to his guru-patni? Wont Takshaka cause any trouble? Please keep reading to know the answers :). For a person who always speaks Truth, whatever he speaks will become true! Anger, even for a fraction of second, may cause disasters. Importance of parishubhrata, especially for bhojanam, is clearly displayed in the story. The otherwise calm Udanka, became angry because the food offered to him (an Atithi, knowing Atithi-devo-bhava) had dosham. One must do bhojanam as if he was doing a yagnyam. The knowledge of shaastras helped Udanka to immediately decide who needs to be blamed for the dosham in the food. The power in Tapas (Daiva-dhyaanam) is clearly displayed by Udanka. With his tapas-shakti, he was able to undo his mistake. Once upon a time, there were two brothers Shankha and Likhita, who were Munis and used to live in their Aashramams on the banks of the river Baahudaa. One day, the younger brother, Likhita, went to the Shankha’s aashramam and on not finding his brother, sat under a mango tree. He started eating one of its mangoes, without taking the permission of the owner of the tree (Shankha). Shankha returned to his aashramam and found Likhita eating the mangoes. Shankha then told Likhita that, one must never take the things which do not belong to them. He said “You should have eaten it only after taking my permission”. He further told Likhita to go to the King, Sudyumna, tell him the mistake he did and take the appropriate punishment, according to the Danda-neeti-shaastram. Likhita adheres to the word of his brother and immediately goes to Sudyumna. The King warmly welcomes the Muni and upon being asked the reason for coming, Likhita tells what had happened and begs the King for punishment. The King who knows all the Dharma shastras, replied that “O great Muni! You leave all the pleasures of normal humans and do Tapas for the welfare of everyone. How can I give you punishment?”. Likhita replies saying that a King must never deviate for his duty and hence, must punish him. The King accepts and orders that Likhita’s hands must be cut-off (following Danda-neeti). Likhita immediately goes and takes a dip in the Baahudaa Nadi and to his surprise sees that he gets back his hands. Knowing that his hands came back due to the power of Shankha, he asked his brother that if he has so much power why did he ask him to go to the King for punishment, instead he himself could have given it. The elder brother said that everyone must do his own duty. Our duty is to do Tapas for the benefit of the society and the King’s duty is to punish the bad. Hence, he said, he had no right to punish his younger brother. This story was told by Vyaasa Bhagavaan to Dharmaraaja when he was worried that all relatives, friends etc. are killed in the Yuddham. Vyaasa Bhagavaana says Dushtas must be punished. Duty of the King is to do that. So there is nothing wrong in Yudhishthira doing the Mahabhaarata Yuddham, to kill the bad. Respecting elders, though sometimes their words may seem harsh, is a very important aspect of Indian culture. The younger brother always respected his elder brother and adhered to his words. Also, the elder brother always wanted the good of his brother. Thus did not pamper him by neglecting the mistake he did, considering it small. Everyone in the story performed their duties. The sages did tapas, the King did Dharma-paalanam, younger brother listened to the elder one. The elder brother always thought about the good of the younger one. One has to experience the results of his own karma some or the other time. Knowing this, the elder brother asked his younger brother to experience the punishment given by the king rather than postponing it to hell. Stealing, knowingly or unknowingly results in big paapam. For stealing one mango, that too being a sage, the punishment was as severe as cutting off hands. The bad result of stealing (even by mistake) is well illustrated in King Nruga’s story too. If stealing one person’s belonging is such a crime, imagine how much magnitude of crime is committed by stealing public/government money/property (bribes). Similarly, destroying public property must never be done. Since, it will effect many individuals not only one. What’s keeping us busy now?